The Defenders must fight together, along with Stick, against the agents of the Hand that are descending on the restaurant. Alexandra slips out before the bulk of the fight can begin, while Elektra must stay behind and fight too. Matt is quick to grab her and pull her aside, saying he wants to talk to her. He won't attack her but does fend off her blows as best as he can against such a skilled fighter. They slip outside where Matt implores her to remember who she was, saying that he held her in his arms as she died. When he calls her by her name, Elektra, she stops attacking him and appears to be confused in having some memories return. The moment is interrupted when Murakami comes outside and asks what she is doing. Murakami tries to attack Matt but Elektra stops him from doing so, knocking him out, and then she escapes into the night. Agents of the Hand try to kidnap Danny but Jessica and Stick stop them. Luke gets into a confrontation with Sowande and ends up hit by a truck, though he's presumably unscathed from the hit. Jessica, Stick, and Danny get out back and meet a still-shaken Matt. Together, they all escape into a sewer tunnel and head back to their hide-out. Luke arrives after them, having brought a long Sowande, whom he kidnapped. When Sowande is questioned, he warns that all the loved ones of the Defenders are in danger, so each of them sends the people most important to them to the police station to be watched by Misty Knight. Those present include Claire, Trish, Foggy, Karen, and Colleen. But before Colleen goes to the station, she is confronted by a resurrected Bakuto, who was formerly her mentor. He tries to recruit her to formally join the Hand, which had been what she was raised for before leaving in order to be with Danny. 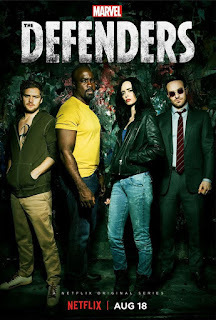 The Defenders, plus Claire, all arrive in time to stop Bakuto and rescue an injured Colleen. Matt finally decides to reclaim his Daredevil identity and dons the suit once more, just in time to help Jessica fight off another attack from the Hand. The other leaders in the Hand are concerned by this particularly as Elektra had knocked Murakami off his feet when he was going to attack Matt. Murakami is skeptical of whether Alexandra is right to put so much faith in Elektra and to be so reliant on her to fulfill their goals. He reminds them all that the Hand used the last of their resources on resurrecting Elektra and thus they are all susceptible to death. Murakami consults with the other Hand leaders and proposes they put a new plan together without her. Sowande tries to escape but Stick stops him by way of decaptiation. Alexandra goes to Elektra's room to check on her but Elektra has gone out into the city. She returns to the roof where she was killed and further retraces her steps by going to Matt's apartment and lying in his bed, where she had been before when injured and recovering. The Defenders is available for streaming on Netflix.